AVRX550U 500VA 300 watt ultra-compact 230V line interactive UPS offers complete AC power protection from blackouts, brownouts and transient surges. Uninterruptible Power Supply operation maintains battery-derived AC output during blackouts to prevent data loss and system downtime for connected equipment. Automatic Voltage Regulation / AVR corrects extended brownouts and overvoltages from 159 to 282V, without using battery power. 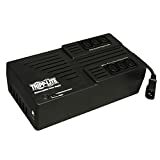 This entry was posted in Desktop Computers and tagged 300W, 550VA, AVRX550U, LineInteractive, Lite, Outlets, Port, Tel/DSL, Tripp, UltraCompact by Computer Education World. Bookmark the permalink.